Longing for a work from home job? It's not impossible but it's also often not as easy as it looks. Job hunting, in general, can be time-consuming and a bit stressful. 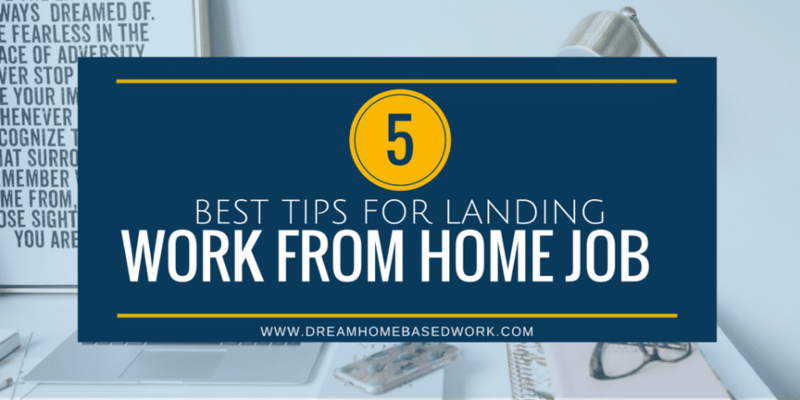 It's important to make sure you have the right tools and strategy to land an ideal work from home job. Here are 5 tips to help you get started. The first thing you need to do when looking for a work from home job is update your resume. Just like with a traditional job, companies looking for remote workers may ask to see a resume with related work experience before considering you for a position. Take some time to polish your resume as well as your LinkedIn profile. Employers will definitely search your name online and you want your professional LinkedIn profile to show up to demonstrate all your experience. LinkedIn could also serve as a great tool to connect you with recruiters and quality remote positions that you can apply for. One of the best places to start searching for work-from-home jobs is job search sites for specifically for remote opportunities. Sites like FlexJobs, Jobspresso, RemoteOk, and Remotive are all great places to look. You can also check out freelance sites like Upwork and the ProBlogger job board. At the start of your search, you may not have an idea where to look for the best jobs. Sign up for some of the sites mentioned above and also see if you can join their email lists to receive daily or weekly job notifications. You can also find a variety of job leads right here on this site. The directory is updated regularly so you don't have to do all the hard work tracking down opportunities by yourself. More and more people are transitioning to online work these days. Chances are, if you mention your desire to start working from home to your network, someone will have a lead or connection that could possibly help you. This is why it's great to maintain a solid network of people that can support you while you support their needs and interests as well. One day, I heard about a work from home company from a neighbor after mentioning my desire to stop commuting to the 9-5 job I had at the time. I never would have found out about the opportunity had I not connected with her and shared my interest and goals. If your network is small, consider joining some online communities or even Facebook groups you can connect with others and share leads, ideas, and resources. Don't make the mistake of thinking that you have to run out and find nationwide or global companies that hire remote workers. There may be some companies right in your area that hire people to work from home. You can start by inquiring at your current job. This will only work if your position involves office or phone work that you could probably do at home. Ask your boss if they allow employees to work remotely part or full time. I know someone who worked at an insurance company and asked her employer to work at home after she gave birth to her child. Her boss agreed but this won't be the case for everyone even though it is worth a try. Your other option would be to search for companies in the area that clearly show an interest in hiring remote workers. If you are interested in freelance work, you won't have trouble finding people who will allow you to work from home as long as you meet deadlines. Reach out to small businesses and entrepreneurs in the area to see if they need any help managing tasks. You may be able to land a position as a virtual assistant or you can offer to help manage social media. You may have to meet up with clients who are local every now and then, but the bulk of your work can be completed at home or anywhere for that matter. Finally, you really want to market yourself if you have a goal to work from home. Opportunities won't fall into your lap, especially if you don't make your interests known. Be sure to let friends and family know that you're looking for a work from home job. This can also help build your brand and establish credibility in your field. Sometimes, you have to think outside the box when it comes to landing a job especially one that grants you location independence. 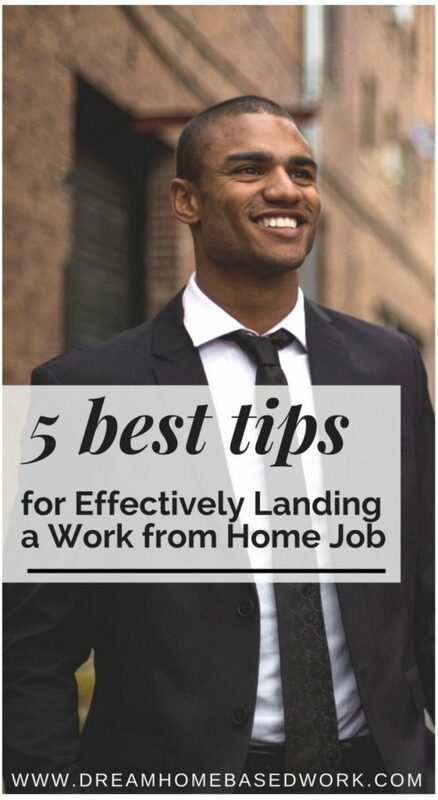 I hope these tips help you get a leg up on the competition and start working a job you enjoy soon enough.